Host Pathogen relationship is sometimes a horribly complicated molecular network. Merely infecting a host and continuing to do so, is not the goal of the pathogen (See my earlier post). Bacteria has been well studied in this contex. Quorum sensing is a method of establishing communication with other bacteria to determine what would be the right time to carry out a particular activity. Similar communication system exist in fungal and parasitic world, though they havent been studied in extensive detail. Viruses are different. It is not sure if we should even call the viruses as a living entity. Bacteriophages are viruses that infect bacteria with most phages having 2 types of life cycle to choose from. Though on the overview it appears that lytic or lysogenic cycle is a random choice for phage, it is not so. It is known that the number of host available to infect has an has an influence on choice of life cycle. Think about it. If there are too few bacteria for the phage to infect, most probably that whole population is going to die and progeny phage will have nothing to further proliferate. So it is more wise to be latent and wait for the bacteria to replenish in such cases. On the other way around, having a lot of bacteria to infect around would mean that it is better to go after a lytic cycle. 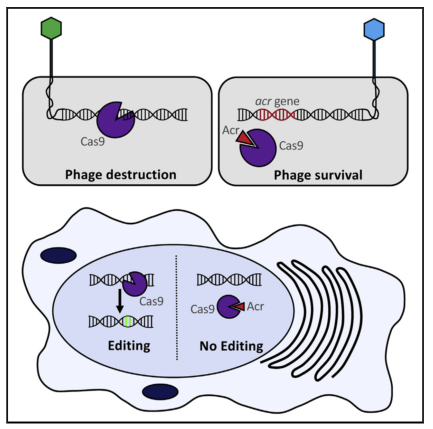 So how does the phage decide? The decision to undergo lytic or lysogenic cycle depends on certain molecular switches. There has been substantial enquiry into these pathways and there is a reasonable understanding of what is probably happening. However, phages by themselves communicating is not known, untill now. In a recent publication in nature, a team has for the first time, identified a peptide molecule (called as arbitrium) to communicate with one another that literally decides the life cycle choice. The researchers started with a hypothesis that bacteria secrete communication molecules to alert other bacteria of phage infection. For this, Bacillus subtilis strain 168 were infected by four different phages- phi29, phi105, rho14 and phi3T. 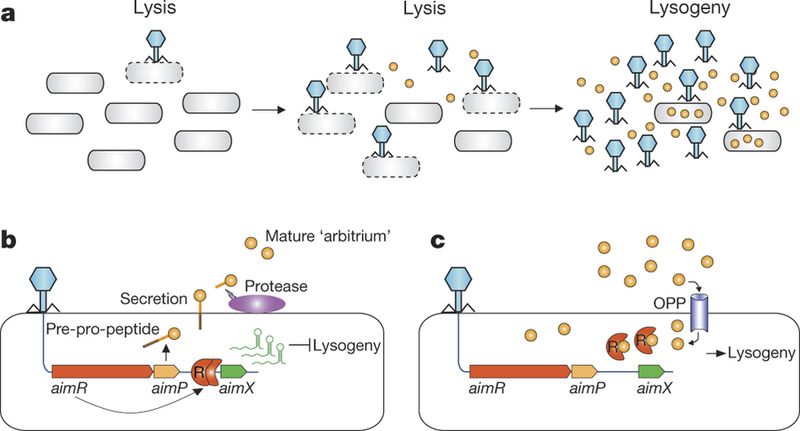 A chance observation led to the hypothesis that a small molecule is released to the medium during infection of B subtilis by phi3T (Phenomenon was not observed in other phages) and it probably modulates infection dynmaics of the phage. Further study showed it was a short peptide. The researchers went ahead and sequenced the phi3T genome and made came up with a couple of candidate genes. Of these, one gene exhibited features reminiscent of Bacillus quorum sensing peptides which encoded a short ORF which could be processed by B subtilis extracellular proteases (based on consensus cleavage site for peptide maturation). The predicted peptide was Ser-Ala-Ile-Arg-Gly-Ala (SAIRGA) which was subsequently confirmed by mass spec analysis. The peptide was further verified by showing that there was a dose dependent effect of elevated lysogeny in the presence of the SAIRGA peptide. The gene was named as aimP, which is located just next to another gene that codes for tetratricopeptide repeat (TPR) domain, typical of intracellular peptide receptors of the RRNPP family in quorum sensing systems. This gene turned out to be the receptor. The rest of the paper deals with experiments to identify how this system works. 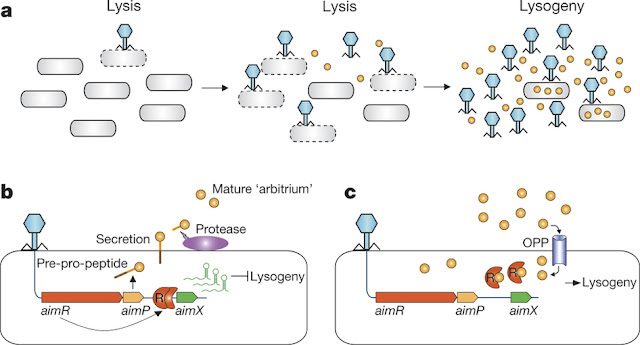 Transcriptome analysis of phage for effect of arbitrium had a transcript (aimX), that was immediately downstream to the AimR DNA-binding site. This transcript showed substantial expression in the absence of the arbitrium but was severely reduced in presence of the peptide. Based on some more genetic knockdowns and other assays the researchers came up with a model shown in Fig 1. Erez, Zohar et al. "Communication Between Viruses Guides Lysis–Lysogeny Decisions". Nature 541.7638 (2017): 488-493. Hargreaves, Katherine R., Andrew M. Kropinski, and Martha R. J. Clokie. "What Does The Talking? : Quorum Sensing Signalling Genes Discovered In A Bacteriophage Genome". PLoS ONE 9.1 (2014): e85131. Ever since MCR-1 has started making its news as an antibiotic resistance gene of interest, a lot of reports have been published around the world looking into colistin resistance. It should be noted that MCR-1 is not the only mode of colistin resistance. Here is a recent report on one such example. The patient was a female Washoe County resident in her 70s who arrived in the United States in early August 2016 after an extended visit to India. She was admitted to the acute care hospital on August 18 with a primary diagnosis of systemic inflammatory response syndrome, likely resulting from an infected right hip seroma. The patient developed septic shock and died in early September. During the 2 years preceding this U.S. hospitalisation, the patient had multiple hospitalisations in India related to a right femur fracture and subsequent osteomyelitis of the right femur and hip; the most recent hospitalisation in India had been in June 2016. This article raises the red flag of how serious the issue of pan-drug resistance has now become. Basically, at least in this case, there was nothing in the antibiotic panel that could have been used for treatment. Technically speaking it is a total drug resistant Klebsiella pneumoniae species. It is still called pan-drug resistance since The isolate had a relatively low fosfomycin resistance and was intermediately resistant to tigecycline. The article mentions the possibility that this strain was acquired from India but cannot confirm the same due to several reasons. Colistin resistance in Klebsiella has been described earlier in India in 2014. However, it is absurd from the side of media to blame that colistin resistance comes from countries like India. Colistin resistance has been reported as early as 2009 in US. A Nevada woman dies of a superbug resistant to every available antibiotic in the US. Chen L, Todd R, Kiehlbauch J, Walters M, Kallen A. Notes from the Field: Pan-Resistant New Delhi Metallo-Beta-Lactamase-Producing Klebsiella pneumoniae — Washoe County, Nevada, 2016. MMWR. 2017;66(1):33. Goel G, Hmar L, Sarkar De M, Bhattacharya S, Chandy M. Colistin-Resistant Klebsiella pneumoniae: Report of a Cluster of 24 Cases from a New Oncology Center in Eastern India. Infection Control. 2014; 35 (08):1076-1077. Marchaim D, Chopra T, Pogue J, Perez F, Hujer A, Rudin S et al. Outbreak of Colistin-Resistant, Carbapenem-Resistant Klebsiella pneumoniae in Metropolitan Detroit, Michigan. Antimicrobial Agents and Chemotherapy. 2010;55(2):593-599. Before I talk about anything, I wish you a happy new year. I concluded my 5 years of blogging in the last year and now beginning with the 6th. Some of my friends suggested me that I should have written about Predatory bacteria as a potential alternative for antibiotics, the hit paper of year end in 2016. I did write about the concept of predatory bacteria long before (Link). A lot of people are interested in the latest papers on predatory bacteria as an alternative to antibiotics. There are 2 papers that need to be talked about. Shatzkes et al; 2016 paper that used a rat model with Klebsiella infection, and Willis et al;2016 Zebrafish model with a shigella infection. Shatzkes et al relied on the earlier research and considered 3 strains of well studied predatory bacteria- B bacteriovorus 109J, B bacteriovorus HD100 and M aeruginosavorus ARL-13. Their first experiment showed that these predators by themselves didn’t cause any pathology in Sprague-Dawley rat models when administered through the respiratory route. The second experiment was to inoculate the rats with K pneumoniae strain (sublethal dose) and co-inoculated with multiple doses of predatory bacteria to determine their ability to reduce bacterial burden within the lungs. Interestingly, different predators had different levels of inflammation induced in the lung and B bacteriovorus HD100 exhibited reactive lymphoid hyperplasia and acute inflammation at 24 h post inoculation. However, in all cases, by 48 hours all levels were nearly back to normal. Also, K pneumoniae burden was reduced by more than 99.9% in the lungs of a majority of rats. The study also noted that the predators didn’t move out of the respiratory much but the K pneumoniae did easily. The next step was to see how this performs in a burdened condition. To study this, 36 rats were introduced with 3.3 x 107 CFU/rat of K pneumoniae (intranasal inoculation) vs PBS (Phosphate buffered saline) controls of 36 rats. The 36 infected rats after a day were divided into 3 groups and each given a treating dose of (4 times) PBS, 4.6x 108 PFU/ rat of B bacteriovorus 109J, or 6.6 x 107 PFU/ rat of M aeruginosavorus ARL-13. Though the results were variable (depending on predator strain being used), results did show significant reduction of infection burden. These are time restricted experiments and rat models are not analysed for a long period to look for recurrence. Dr Kadouri, who is a senior author of the paper explains, “There were no adverse effects on the animal. There was no type of histological tissue damage or signs of sustainable inflammation. They were perfectly healthy. We don't know what happens after longer time points, whether the pneumonia will rebound". The team is currently investigating ability of predatory bacteria to treat eye infections and wound infections in animal models. "When we get that data, it will give us a good idea of whether or not it is effective enough to go into clinical trials. At this point, I think we can make a very strong case that it is safe." The second is a study in Zebra fish model with Shigella flexneri infection. The study essentially finds what I just discussed above. Bdellovibrio bacteriovorus is a common strain found in natural habitats and signatures of it have been found in gut samples of healthy children, thus indicating it is safe in humans. The study first tested the ability of predator to be tolerated by the larvae. Subsequently the larva was challenged with shigella and found that in presence of the predator there was an increased survival of the larvae. To see what role did immune system have in the process, the researchers depleted the leukocytes of the host and then infected the larva with Shigella and Bdellovibrio. They found that though the predator had reduced shigella numbers in the larvae in both test case, survival was significantly greater in immune-competent larvae. Prof Liz Sockett comments, "It seems that the Shigella pathogens are evading the immune system, but when Bdellovibrio is there it is releasing broken parts of Shigella and that is giving extra signals to the fish that it should be dealt with". Predatory bacteria forms a very attractive candidate for a couple of reasons as in contrast with antibiotics. First, antibiotics work in a dose dependent manner. That means higher the bacterial load, more antibiotic is required to kill. But for most cases, the antibiotic dose that is given to a patient is constant. Second, antibiotics have to be given as a multiple does. But predators can multiply themselves and hence at least theoretically, is a single administration. Shatzkes K, Singleton E, Tang C, Zuena M, Shukla S, Gupta S et al. Predatory Bacteria Attenuate Klebsiella pneumoniae Burden in Rat Lungs. mBio. 2016;7(6):e01847-16. Willis A, Moore C, Mazon-Moya M, Krokowski S, Lambert C, Till R et al. Injections of Predatory Bacteria Work Alongside Host Immune Cells to Treat Shigella Infection in Zebrafish Larvae. Current Biology. 2016;26(24):3343-3351.